The Department of General Practice has been working with general practitioners, nurses, reception staff and practice managers to better provide health care for their Aboriginal and Torres Strait Islander patients. Ways of Thinking and Ways of Doing or WoTWoD is the name of an NHMRC funded project which is a joint initiative between the University of Melbourne and the University of New South Wales aimed at improving the cultural and clinical appropriateness of community health services and general practices. It is conducting a randomised controlled trial in Melbourne and Sydney to test the effectiveness of an intervention program andpart of the intervention is providing workshops to GPs and practice staff on cultural awareness and intervention strategies at a practice level to address the health of patients with chronic disease. The first workshop, led by the Melbourne team which consisted of Aunty Di Kerr, Aunty Vicki Wade, Dr Phyllis Lau and Nina Fitzgerald, was held on 22nd August. There were 19 participants which included GPs, practice nurses, practice managers, reception and other practice staff. Aunty Di Kerr of the Wurundjeri people is a cultural mentor for the WoTWoD project. She welcomed the participants to country and provided her cultural expertise to the workshop and discussion. Aunty mesmerised all present with her story of her ancestors across Melbourne and her family history through the artwork on her possum cloak. Aunty Vicki Wade is a Noogar woman active in her community in NSW and and she is the Lead of the National Aboriginal Health Unit at the National Heart Foundation. Vicki provided participants with background to the importance of cultural safety and security for the Aboriginal and Torres Starit Islander community. She and Dr Phyllis Lau are Chief Investigators on the WoTWoD project. 'I left feeling quite motivated about how we can become more pro-active in identifying gaps in care for the Indigenous population and working towards better serving the needs of Aboriginal and Torres Strait Islander Australians by closing these gap,' said a workshop participant. The relationship between general practitioner and their patients is a journey and the workshop intends to assist GPs and staff with tools to nurture interaction. With participants working together with the Aboriginal team members, the workshop lent itself to an interactive learning environment around respect, responsibility and equity for all parties. The NHMRC project, Ways of Thinking, Ways of Doing is a three year initiative to address the health gap and the important role that primary health care play. 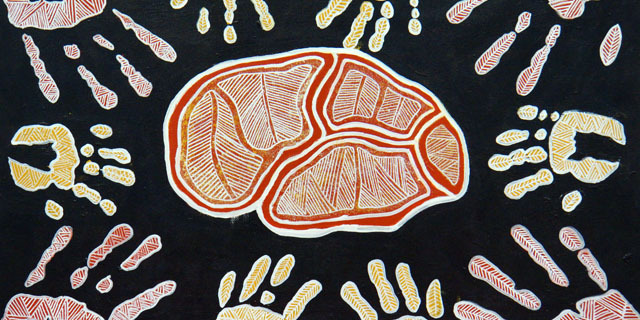 The project was approved by the ethics committee at the Aboriginal Health and Medical Research Council, the Universities of Melbourne and New South Wales. About the artist: Ashley is a 27 year-old Yorta Yorta Wurundjeri man. In 2007, he received the Lin Onus Award at the Victorian Indigenous Art Awards for a portrait of the Wurundjeri leader and artist William Barak. Ashley's mother is the respected Wurundjeri Elder Aunty Diane Kerr from the Ganun Willam Balak clan.